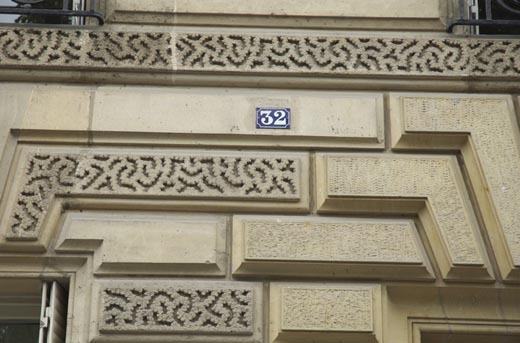 32, rue Guynemer | Mystère et boules de gomme ! 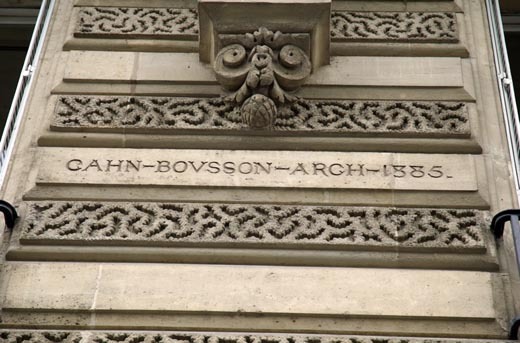 With apologies to the current tenants of this stately building who must now suffer more FIA fans out front each day snapping pictures, there it is, the real address of a fictional family that lives forever in our hearts. I might have hesitated to publish it at all, given the desire of notre prof to keep it a secret, were it not for the fact that le chat est déjà sorti du sac. I just returned from my first visit to Paris. Having studied with French in Action, I was more excited to see the locations of FIA than Da Vinci Code! We stayed in a very nice hotel a block from the Jardin du Luxembourg. 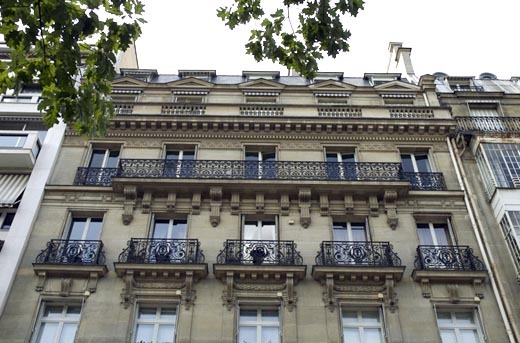 While the hunt for Mireille and Marie-Laure continues, I can say with certainty that I have located chez Belleau! In Lesson 32, M. Belleau shows Robert the “vue imprenable” from the balcony. From this, it was evident that the apartment was on the west side of the Jardin du Luxembourg–with the Senat to the left and the Pantheon straight ahead. 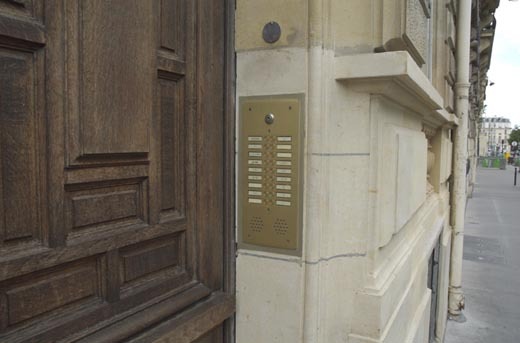 By exploring the portals of the buildings on rue Guynemer, I found the exact entrance that was used for chez Belleau in FIA. 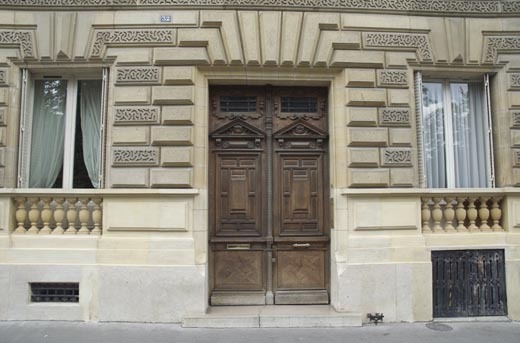 So if you are visiting, walk by 32 rue Guynemer to see the actual location that played the role of 18 rue de Vaugerard. After thoroughly enjoying the incomparable Jardin de Luxembourg one beautiful day last month with my wife, I headed over to the western gate, while she took a breather on one of those hallowed park benches. 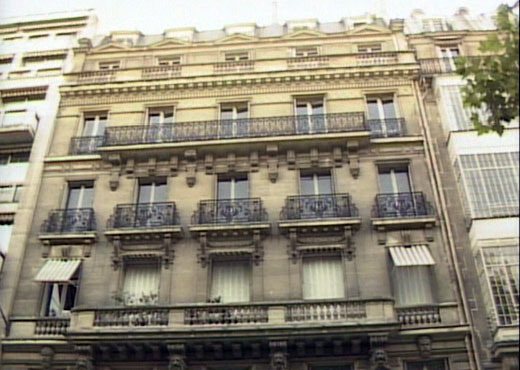 Upon exiting the Jardin and looking to my left (south) along rue Guynemer, I quickly located the building, which looks precisely as it does in FIA, filmed 22 years ago. How lucky are the residents of the of this magnificent structure, even if Mireille doesn’t brush past them on the escalier! Do you think any of them have ever heard of French In Action? 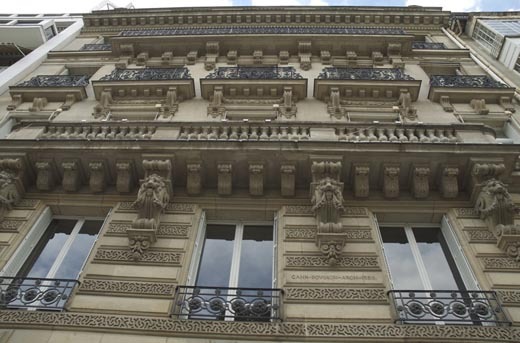 It would be interesting to learn how the apartment on the quatrième étage was chosen by the producers of FIA. According to Norman Barth writing in Paris Kiosque, Rue Guynemer was once within the Jardin de Luxembourg and later, before it was named for the celebrated WWI flying ace, was the southern extension of Rue Bonaparte which now begins to the north of the intersection with rue de Vaugirard (on which this building is said to be in FIA, see the article below). Elsewhere on the internet one finds a photo of Leclerc’s forces along rue Guynemer as they liberated Paris from the Nazis (the Belleau’s residence is not visible). The first shot below is from a FIA screen cap. The others are my photos of this lovely building. Hope you enjoy them and get a chance yourself to stand in front of chez Belleau! Pourquoi Robert est-il perdu ? 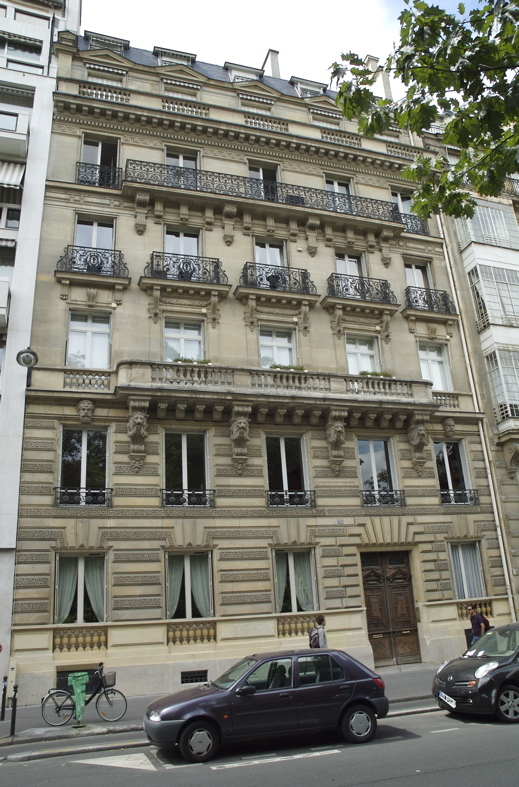 Il y a quelques jours, après le dîner chez les Courtois, il a vu le bâtiment des Belleau quand il a accompagné Mireille à chez elle. 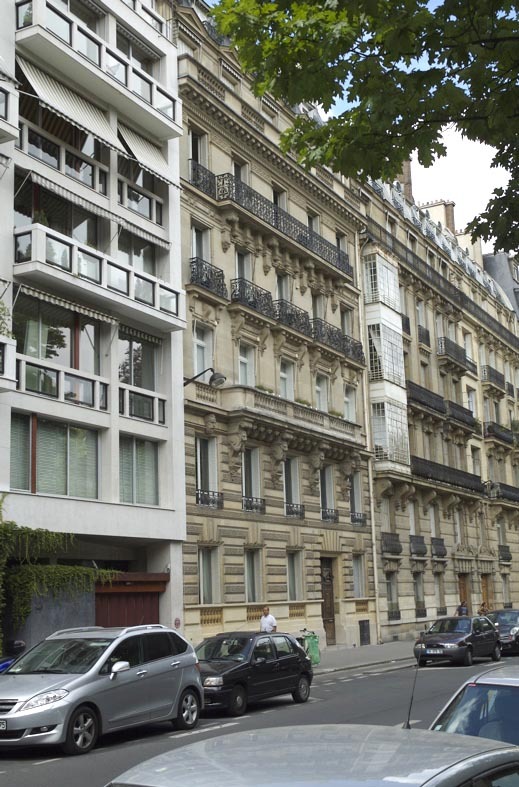 Googling the architect, Cahn-Bousson, finds his Monograhpies de Batiment Moderne prominently featuring our favourite maison, then known as 32 rue du Luxembourg. The second slide shows the ground floor plan. (Hope the above links work okay… I dunno from WordPress). 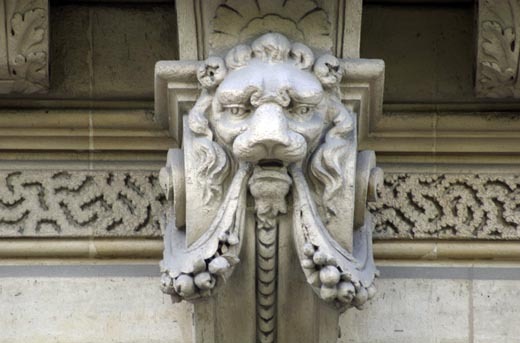 You can also look it up on Pages Jaunes (www.pagesjaune.fr) by asking for 30 rue Guynemer, clicking on Photo, then « walking » left one building. Click on Plan to pull up a map on Mappy. There are apparently no commercial enterprises in the building, so you can’t look it up directly by address.